The One-on-One Plus Conference brings together the largest number of professionals of any conference of its kind. The unique one-on-one format gives writers and illustrators a rare opportunity to share their work with an assigned mentor from the children's publishing world, whether it be an editor, agent, art director, or published author or illustrator. These professionals generously volunteer their time to not only critique the work of new and talented writers and illustrators, but also to share constructive information about the overall business of publishing. Every attendee is guaranteed a forty-five minute one-on-one manuscript or portfolio review session, and there are additional opportunities to network with our 80+ faculty members. As a writer	or illustrator of children's literature, you are always growing in craft. 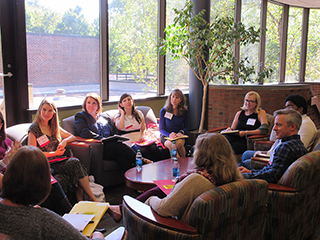 The One-on-One Conference is a rich opportunity to share your information, questions, and ideas with professionals. We hope you'll join us. An opportunity to share your work with professionals. 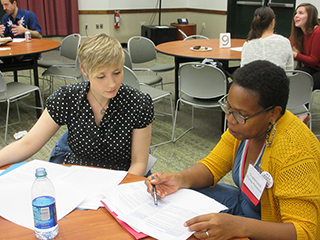 Mentees are paired one on one with experienced authors, illustrators, editors, art directors or agents. Every attendee is guaranteed a forty-five minute personalized critique of their submitted work in progress. A roundtable discussion where you and your mentor join four other pairs to exchange ideas and information on any topic related to the writing, illustrating, and publishing of children's books. We welcome those with work in progress, people actively pursuing careers as authors and/or illustrators of books for young readers, both developing professionals and established professionals. We welcome submissions in all genres: both fiction and nonfiction; picture book, easy readers, middle grade and young adult. We welcome diverse voices and points of view.